I notice the scent first. Sliding sneakily up my nose, it infests my olfactory system. Breathing in deeply, I am drawn to its source, in much the same way a pan of cinnamon rolls draws me to an oven. Even if it’s not my oven. It’s a smell that tugs at my nose hairs and heartstrings, begging me to seek out its source. It is apple cider, and today—on a Thursday morning in September—it is being pressed. Here at Sweet Seasons Orchard, Ed and Nan Jasinowski press cider, fry doughnuts and sell an array of apple varieties, as they have for 36 years. Apples gently tumble their way out of a wooden crate and onto a plastic conveyor belt. Their journey to cider-hood continues by being pressure-washed inside a stainless steel box. They emerge from the outside of the box glistening with droplets of water. The apples then fall into an apple reservoir called a hopper. A conveyor belt then carries the apples 10 feet high and drops them into a grinder, which makes a glorious racket as it chews up apples into dime-sized pieces. Below the grinder sits a square, wooden frame nestled inside a four-foot wide metal box. A clear plastic pipe is affixed to a drain in the metal box. Amber cider pulses through the variegated plastic at regular intervals. A section of gray cloth lays loosely in and over the wooden frame. Flecked with red skin and brown seeds, the apple pulp falls down like sugary, fat snowflakes into the waiting square of cloth. As the pulp piles up, Jasinowski—dressed in a white waterproof jumpsuit—smooths it evenly into the corners of the cloth covered frame. When the frame is full, Jasinowski slides in a metal sheet beneath the grinder, and the pulp precipitation momentarily ceases. He folds over the corners of the cloth, enclosing the pulp within. Jasinowski grabs a thick piece of ridged, white plastic from the table behind him, and places it on top of the now-oozing square of pulp-filled cloth. The wooden frame he used earlier is placed on top of the ridged plastic, and with that, the first layer is done. The second layer begins anew. And so it goes, for a total of six pulp frames. When the last frame is full, Jasinowski slides the pulp tower over on little wheels to the hydraulic press. Jasinowski cuts the power to the grinder, and the din of grinding metal slowly quiets down. The press squeezes out the cider from the pulp, russet-colored juice dribbling its way down into the box below. After the juice’s exodus from the pulp, Jasinowski picks up each cloth square of pulp and dumps it onto another elevator—this one carrying it outside the cider room and onto a wagon waiting out back. Too acidic to amend the tree’s soil, the spent pulp will get dumped in the tree line. And then, the second batch is finished. Five more batches to go. It takes one bushel (48 pounds) of apples to make about three-and-one-half gallons of cider. It takes 10 bushels of apples for one pressing cycling, creating around 33 gallons. The cider operation has been an integral aspect of the orchard since the Jasinowskis first bought the farm. 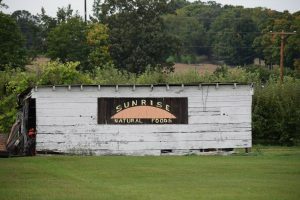 But before Ed and Nan bought the farm, they were the proprietors of Sunrise Natural Foods, a health-food store in downtown Albion. “We opened [Sunrise] in 1977, and we had that for just about five years,” he said. 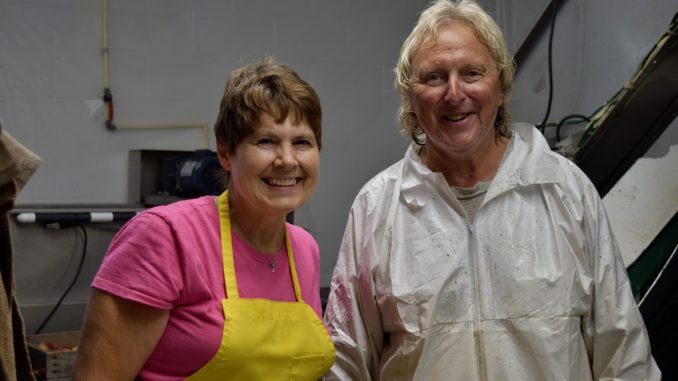 At their location next-door to the Bohm Theatre, Ed and Nan supplied trail mix to college students living in their dorms, in addition to more niche food items that were harder to come by in the 1970s, like homemade peanut butter and frozen yogurt. The friendships he made at the store, he said, were everlasting. When the opportunity to buy the orchard that is now Sweet Seasons arose, though, buying it wasn’t a hard decision. “We started talking with the owners around 1980…With our natural food background, we were ready to ‘get back to nature.’ We loved it back here,” he said. Mother Nature thought the Jasinowki’s were a good fit for the land, too. While the yields have ebbed and flowed over the years—like 2012’s total loss—a few aspects of the business remain constant: The smell of deep-fried sugar dough wafting through the air; the opportunity to buy the same style of organic, freshly-ground nut butters that used to be sold at Sunrise Natural Foods; and the trees themselves—some of them over 70 years old. It’s a type of work that Ed enjoys. “It’s been a great lifestyle. It’s not something to get rich from, but, ya know, we put things into [a] different perspective: Look at all this,” Ed says, and spreads his right arm, indicating the apple trees—boughs laden with fruit—and the rest of his farm. 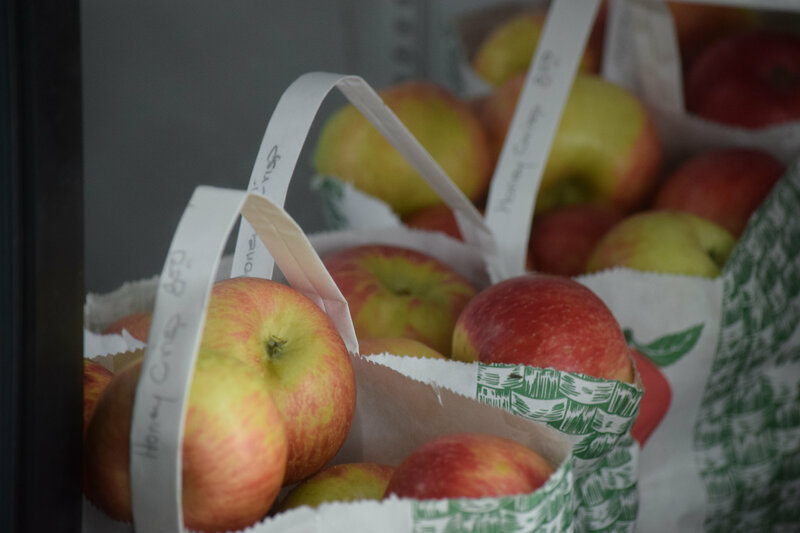 Sweet Seasons Orchard is located at 15787 Allman Road, Concord, just four miles south of Albion. It’s open for all your pomological needs seven days a week, from 10 a.m. to 6 p.m. until Thanksgiving. I enjoyed reading this article!! Looks like you guys are doing a great job!